The history of WORX spans back to only 13 years ago when the brand was first launched. Owned by China-based Positec Tool Corporation, it came to life in 2004 after PTC wished to expand from OEM and Black & Decker tools. WORX filled the gap in that market, seeing the beginning of a new line of lawn and garden equipment in production under PTC founder Don Gao’s own branding. The first product launched was an electric lawn trimmer, and the range expanded from there. There are now headquarters in both China and North Carolina. Some of these chainsaws, in particular the pole chainsaws, have the potential to be used in a professional setting, or as a commercial grade product. The majority are suitable just for homeowners, and the competitive price tag make them very appealing on the market. It has an auto-tension chain system which helps stop the chain from coming loose. It’s powerful for the homeowner and those looking to stock up their winter wood supply. In a horizontal position the chain can fall off. Oil is known to leak out on occasion. Some users note the auto-tension feature failing. Dimensions: 8.1 x 14.6 x 20.6 inches. QWhat sharpening kit will this need? AMinimum 14 gauge, 100 foot extension cord. QHow many amps does it have? QWhat is the saw best used for? ATrimming trees, cutting firewood and clearing bushes. This 18 inch electric chainsaw can easily be considered the best WORX chainsaw for the money. It’s powerful, fulfills a variety of cutting tasks and is extremely low maintenance. It has a decent sized bar and chain as well which enables the user to take on bigger tasks than with a smaller electric saw. It also releases zero emissions, has an automatic oiler and offers many safety features to ensure the task at hand is completed safely. It’s for sale at a reasonable price both online and in hardware stores in many countries. Check out what other people who purchased this product think about it. Read WORX WG304.1 corded electric chainsaw reviews. The chain is reliable and doesn’t need sharpened often. It offers users plenty of power. The chain tensioning system works well. The electric cord limits its reach. It uses too much chain lube. It doesn’t have a kick tip so doesn’t cut well at the tip. Dimensions: 8.07 x 19.69 x 14.57 inches. QDoes the saw come fully assembled? QHow long is the cord attached to the chainsaw? QWhat can this saw be used for? ACutting firewood, trimming trees and bushes/hedges. Boasting plenty of power for homeowners without any of the maintenance hassle, this WORX chainsaw is easily one of the best WORX chainsaws for the money. It’s cost effective, has well priced parts, and comes fully assembled and ready to use. It’s also incredibly lightweight, as well as being top rated in several reviews. It has plenty of cutting power which makes it suitable for a range of households. Check out what other people who purchased this product think about it. Read WORX WG303.1 corded electric chainsaw reviews. Its 8 amp motor is very powerful. It’s a two-in-one, meaning it can be used as a pole saw or off the pole. It has a comfortable top handle. The components aren’t balanced internally to make it easy to navigate on a pole. The chain lube can leak. It’s only comfortable to navigate up to approximately five feet. Dimensions: 9 x 8 x 42 inches. QCan you remove the pole to use it as a chainsaw? QWhat is the max reach it has? 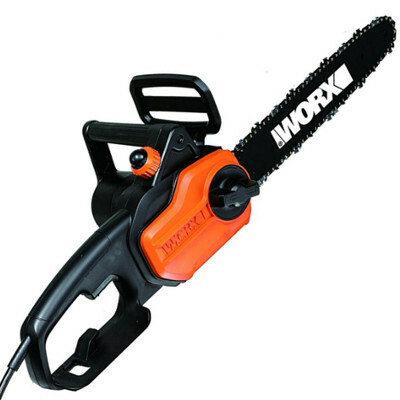 This WORX electric pole chainsaw is suitable for a range of tree trimming requirements. It’s lightweight, low maintenance and has plenty of power to get the job done. However, it does need a strong, firm hand to keep the saw steady. It seems a little off-balance at full reach and this can make it feel unstable. For the price though, you are getting the best deal as you can also remove the pole and use it as just a chainsaw. Check out what other people who purchased this product think about it. Read WORX WG309 electric pole chainsaw reviews. It’s very quiet in comparison to other electric chainsaws. It’s only suitable for light home maintenance. The cord limits its reach. It’s a lot of hassle with extension cords for only light maintenance. It doesn’t have variable speed levels. It only has a two-prong cord rather than the safer three-prong. Dimensions: 10 x 8 x 16 inches. QWhat file is needed for sharpening the chain? QCan you attach a pole to it to make it a pole chainsaw? QWhat diameter can it cut up to? If you’re after a top rated electric chainsaw with consistently excellent reviews for reliability, this is the chainsaw for you. It can cut through wood up to 28 inches in diameter, it’s quiet, lightweight and almost maintenance free. It’s great for homeowners who will only use it casually, and it comes with a highly competitive price tag to position it in the market nicely. Check out what other people who purchased this product think about it. Read WORX WG305 corded electric chainsaw reviews. It has really good safety features. It comes with the battery and charger when some other manufacturers and brands don’t. It can be used for a range of domestic cutting duties. The charger is known to be poor quality. The chain can come off quite easily. AUp to four inches in diameter. QDoes it have an automatic chain oiler? QWhat kind of battery does it have? For those who are not confident with a standard chainsaw but still need to undertake light maintenance, the WORX jawsaw is the tool for you. It’s lightweight, very easy to use, and it has good battery life to undertake home maintenance. The battery also only takes three hours to charge, yet gives you plenty of time to get the backyard spruced up. It has no limitations of cords, is very quiet to run and has plenty of safety features to give the user peace of mind. This could potentially be one of the best WORX chainsaws for the money. Check out what other people who purchased this product think about it. Read WORX WG320 cordless electric jawsaw reviews. It has great safety features for user confidence. It’s easy to use and maintain. It’s very affordable for many people. The chain can fall off easily and is difficult to put back on. The branches can get stuck in the chain easily. It can easily leak oil. AUp to 4 inches in diameter. QCan the jaws of the saw be adjusted? ANo. If the branch doesn’t fit, it’s too big for the saw. This model of jawsaw is a great addition to the WORX range, and is well marketed towards the aging population, or those in need of a quick fix for their backyard maintenance. It’s very easy to use, is lightweight and has excellent safety features for the peace of mind of the user. It’s well priced on the market, and is available online and in many hardware stores. It also requires minimal maintenance which is perfect for those who just don’t have the time or the patience. Check out what other people who purchased this product think about it. 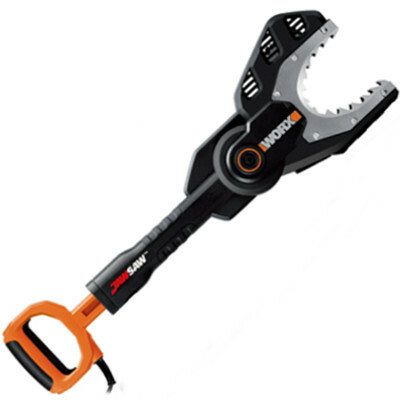 Read WORX WG307 corded electric jawsaw reviews. It has an extendable handle for hard-to-reach places. It cuts limbs up to 12 feet high. It’s powerful for the engine size. It’s quite heavy – especially when put on a pole. It’s limited in its reach by the cord. You can’t take it anywhere where there is no power source. It’s top heavy and unstable when used on the pole. QWhat is the longest extension cord to be used with this jawsaw? ADrain the oil when storing, and sharpen the chain. QWhat is the maximum it can cut through? The WORX jawsaw is designed for the homeowner who’s not quite in need of a chainsaw. It’s far safer than a chainsaw yet has the cutting power of a decent, lightweight domestic chainsaw. It’s not a commercial grade saw – or for a professional – but it certainly fits the bill as a product to undertake home maintenance and tree pruning with accuracy and ease. It’s also easy to store away, requires little maintenance and is affordable to buy. However, with that said, it’s very difficult to use on a pole, and it can be much better to use a ladder rather than the pole. Check out what other people who purchased this product think about it. 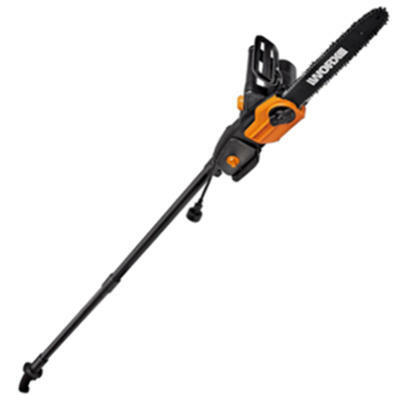 Read WORX WG308 corded electric pole jawsaw reviews. WORX chainsaw bars are incredibly easy to find both instore and online. All you need is the model number – it’s as simple as that! If you’re in need of a new bar for your WORX chainsaw, expect to receive the very best in quality. WORX chainsaw bars have greasable sprockets and a small-radius nose. The greasable sprocket helps enhance cutting performance while extending the bar and chain life, whilst the small-radius nose helps prevent kickback. WORX is serious about safety, therefore they design their chainsaw bars to keep you as safe as possible while using their products. If you are looking specifically for WORX bar, check out this comprehensive guide about available WORX chainsaw bars. However, if you’re looking for a bar in general regardless of the brand, you would love to read this full buying guide on how to select the best chainsaw bar for the money including reviews & comparison. WORX chainsaw chains are designed to stand the test of time. They last a long time, and when maintained with correct sharpening techniques, will see you through several cutting sessions. However, when the teeth get below 4mm, it’s time for a replacement chain. WORX chains are easy to fit and are also very affordable. Some manufacturers and brands put large price tags on their chains, but WORX is all about making sure both their products and their accessories are affordable to a wide audience. WORX prides itself on chains which fit securely and can be sharpened with ease. If you are looking specifically for WORX chain, check out this comprehensive guide about available WORX chainsaw chains. However, if you’re looking for a chain in general regardless of the brand, you would love to read this full buying guide on how to select the best chainsaw chain for the money including reviews & comparison. WORX is the brand, however they are made by Positec Tool Corporation based in Suzhou, China. Where are WORX chainsaws made? 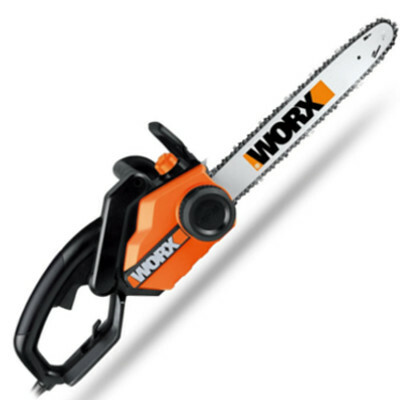 WORX chainsaws are made in China. 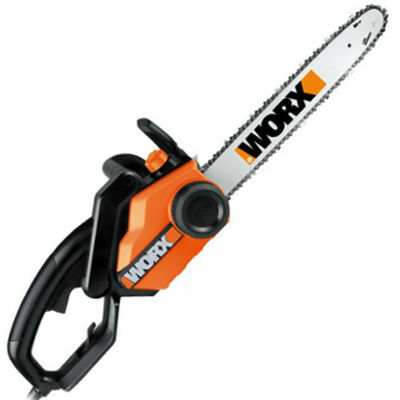 Where do you buy WORX chainsaws? WORX chainsaws can be bought online on websites such as Amazon, or in any major retailers such as Lowe’s, The Home Depot, Canadian Tire, Costco and Walmart.